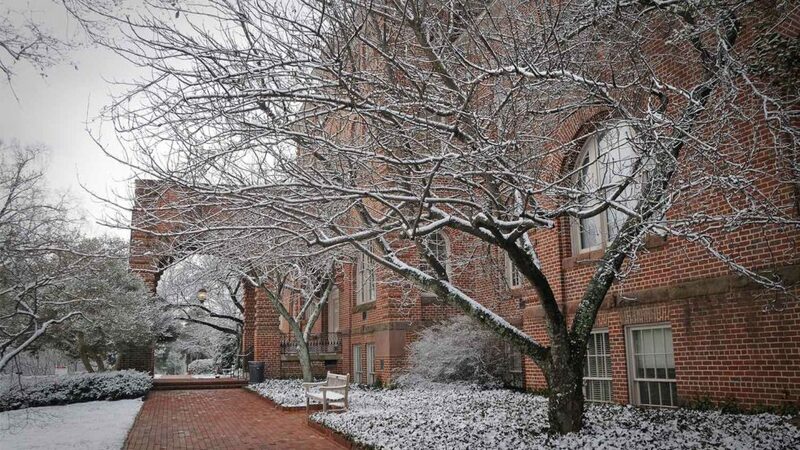 NC State avoided energy costs of $201,981 by using energy conservation measures over winter break. Over winter break hundreds of NC State campus buildings collectively avoided more than $200,000 in energy costs through the university’s Holiday Energy Saving Initiative. These savings come despite the chilliest winter break in nearly 15 years. With winter break temperatures hovering around 34 degrees, campus buildings used more energy than typical winter breaks but still substantially less than normal operation. Additionally, cold temperatures limited regional availability of natural gas, which forced NC State to use an alternate fuel source that’s more expensive. “If there had been no natural gas curtailment, the avoided energy cost over winter break would have totaled more than $325,000,” said Erik Hall, director of NC State Energy Management. NC State’s Holiday Energy Saving Initiative is designed to reduce utility costs while most campus buildings are unoccupied for up to 12 consecutive days. Since the savings initiative began in 2004, NC State has achieved more than $3.5 million in cumulative energy savings. Energy Management leads the campus-wide conservation effort to adjust thermostat temperature setpoints, unplug electronics, close doors and windows, and reduce lighting in buildings and parking garages. Even buildings exempt from temperature reduction – due to events or temperature-sensitive research and equipment – contribute to utility savings through lighting reductions or partial setbacks. Published in Energy, News, Newswire, Uncategorized.